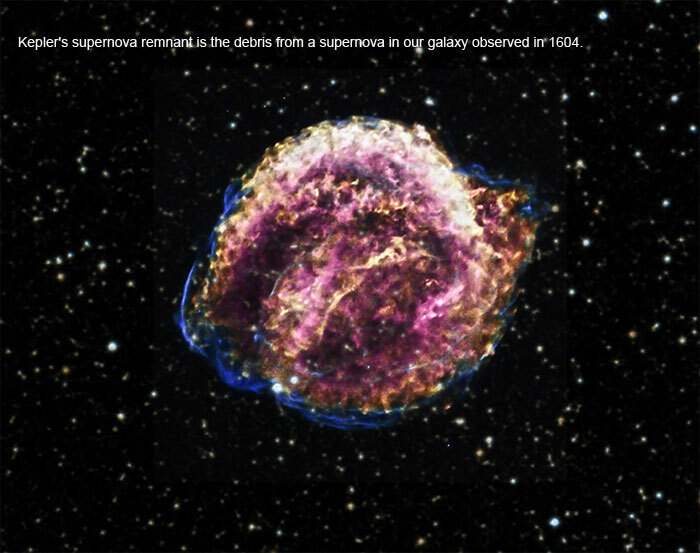 Kepler's supernova remnant is the debris from a supernova in our galaxy observed in 1604. Chandra X-ray data show different colors in a range from lower to higher energies: red, yellow, green, blue and purple. Optical data (pale yellow and blue) from the Digitized Sky Survey shows stars in the field. New analysis suggests that the supernova explosion was more powerful, and occurred at a greater distance, than previously thought. In 1604, a new star appeared in the night sky that was much brighter than Jupiter and dimmed over several weeks. This event was witnessed by sky watchers including the famous astronomer Johannes Kepler. Centuries later, the debris from this exploded star is known as the Kepler supernova remnant. Astronomers have long studied the Kepler supernova remnant and tried to determine exactly what happened when the star exploded to create it. New analysis of a long observation from NASA's Chandra X-ray Observatory is providing more clues. This analysis suggests that the supernova explosion was not only more powerful, but might have also occurred at a greater distance, than previously thought. This image shows the Chandra data derived from more than 8 days worth of observing time. The X-rays are shown in five colors from lower to higher energies: red, yellow, green, blue, and purple. These various X-ray slices were then combined with an optical image from the Digitized Sky Survey (light yellow and blue), showing stars in the field. Previous analysis of this Chandra image has determined that the stellar explosion that created Kepler was what astronomers call a "Type Ia" supernova. This class of supernovas occurs when a white dwarf gains mass, either by pulling gas off a companion star or merging with another white dwarf, until it becomes unstable and is destroyed by a thermonuclear explosion. Unlike other well-known Type Ia supernovas and their remnants, Kepler's debris field is being strongly shaped by what it is running into. More specifically, most Type Ia supernova remnants are very symmetrical, but the Kepler remnant is asymmetrical with a bright arc of X-ray emission in its northern region. This indicates the expanding ball of debris from the supernova explosion is plowing into the gas and dust around the now-dead star. The bright X-ray arc can be explained in two ways. In one model, the pre-supernova star and its companion were moving through the interstellar gas and losing mass at a significant rate via a wind, creating a bow shock wave similar to that of a boat moving through water. Another possibility is that the X-ray arc is caused by debris from the supernova expanding into an interstellar cloud of gradually increasing density. The wind and bow shock model described above requires that the Kepler supernova remnant is located at a distance of more than 23,000 light years. In the latter alternative, the gas into which the remnant is expanding has higher density than average, and the distance of the remnant from the earth is between about 16,000 and 20,000 light years. Both alternatives give greater distances than the commonly used value of 13,000 light years. In either model, the X-ray spectrum - that is, the amount of X-rays produced at different energies â€“ reveals the presence of a large amount of iron, and indicates an explosion more energetic than the average Type Ia supernova. Additionally, to explain the observed X-ray spectrum in this model, a small cavity must have been cleared out around the star before it exploded. Such a cavity, which would have a diameter less than a tenth that of the remnant's current size, might have been produced by a fast, dense outflow from the surface of the white dwarf before it exploded, as predicted by some models of Type Ia supernovas. Additionally, to explain the observed X-ray spectrum in this model, a small cavity must have been cleared out around the star before it exploded. Such a cavity, which would have a diameter less than a tenth that of the remnant, might have been produced by a fast, dense outflow from the surface of the white dwarf before it exploded, as predicted by some models of Type Ia supernovas. Evidence for an unusually powerful Type Ia supernova has previously been observed in another remnant with Chandra and an optical telescope. These results were independently verified by subsequent observations of light from the original supernova explosion that bounced off gas clouds, a phenomenon called light echoes. This other remnant is located in the Large Magellanic Cloud, a small galaxy about 160,000 light years from Earth, making it much farther away than Kepler and therefore more difficult to study. These results were published in the September 1st, 2012 edition of The Astrophysical Journal. The authors of this study are Daniel Patnaude from the Smithsonian Astrophysical Observatory in Cambridge, MA; Carles Badenes from University of Pittsburgh in Pittsburgh, PA; Sangwook Park from the University of Texas at Arlington, TX, and Martin Laming from the Naval Research Laboratory in Washington DC.